Seven in ten University of California administrative and clerical workers, the majority working full time, struggle to put food on the table every month. You read that right – workers at one of the top university systems in the world often have to decide between paying their rent and buying food. According to a study released Monday by researchers at the Urban & Environmental Policy Institute of Occidental College (UEPI), more than two-thirds of UC workers are considered “food insecure” by federal standards. More than two-thirds (70 percent) of UC’s clerical, administrative, and support workers struggle to put adequate food on the table, which is considered food insecure according to the U.S. Department of Agriculture definition. One quarter (25 percent) of UC employees have “low food security” – defined as food insecurity without hunger or reduced food intake but with reduced quality, variety, or desirability of diet. Another 45 percent of UC employees have “very low food security” – defined as food insecurity with hunger from skipping meals or reduced food intake due to a lack of resources. During the release of the study, I also had the chance to talk to two UC Berkeley workers and Teamsters Local 2010 members, Alicia Flores and Joseph Meyer. Both Meyer and Flores discussed the compounding impact of wage stagnation plus increases in their contributions over the years. According to the Economic Policy Institute, over 93% of the workers aren’t paid a living wage. 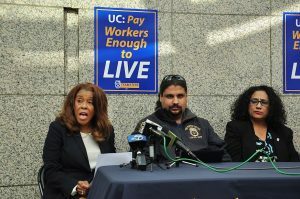 Teamsters Local 2010, representing 14,000 administrative and clerical employees across the UC system, have been in contract negotiations with the UC since the end of last April. Joseph Meyer, a 31-year-old administrative assistant at UC Berkeley, earns nearly $20 an hour but said he skips breakfast and sometimes additional meals to have enough money for his asthma medications. His $1,150 monthly rent eats up more than half of his $2,100 monthly take-home pay. To stay updated on the workers’ fight for living wages that allow them to live where they work AND put food on the table, be sure to follow Teamsters Local 2010 on Twitter and Facebook. 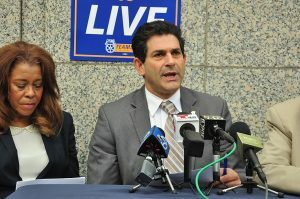 Featured photo caption: (From left) Teamsters President Catherine Cobb and Secretary-Treausrurer Jason Rabinowitz & UEPI’s researchers Peter Dreier and Megan Bomba.